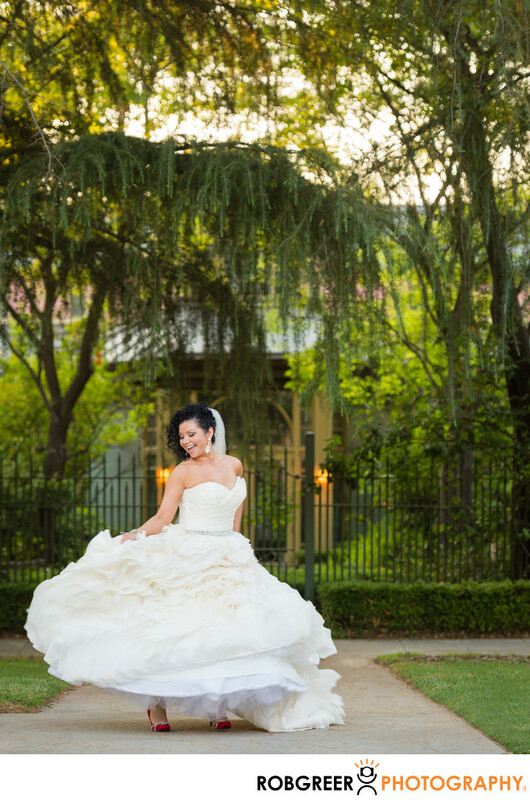 This picture of a lovely bride was captured in a park near The Fox Theater in Redlands, California. The bride had such a lovely personality that I wanted to somehow capture her joyous nature. She also shared with me how much she loved the puffiness of her dress and so I want to capitalize on that for her as well. With that in mind, after we left The Fox Theater, I positioned the bride in such a way that she was presented with an excellent background and golden sunset light, and then I asked her to dance and swirl. I captured several photographs in the series with this is my favorite, particularly as you can see the bride shoes and the movement of her dress quite clearly in the photograph. The Fox Theater is, as you might expect, a converted movie theater that now serves as a wedding venue. As far as wedding locations go, it certainly poses certain challenges in terms of photography. I know the future couples who hire me to photograph their reception that location will certainly benefit from the advice that I can provide in terms of improving some of the venue characteristics select the photography can benefit as well as the perceptions and experience of friends and family. The Fox Theater is located in Redlands, California. Phone: (909) 528-0255. Website: http://foxeventcenter.com/. Contact Person: Suzanne Strauss, (909)792-9111. Location: 123 Cajon St, Redlands, CA 92373. Keywords: Redlands (6), The Fox Theater (6). 1/160; f/3.5; ISO 640; 122.0 mm.